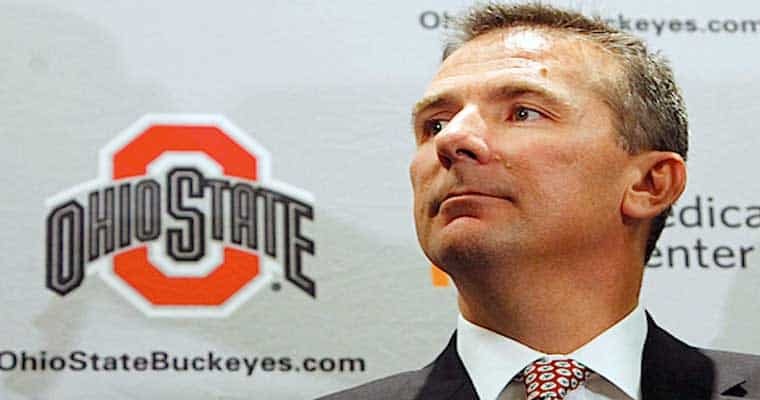 After news broke of Ohio State University placing head coach Urban Meyer on paid administrative leave, oddsmakers acted quickly and adjusted all Ohio State Buckeyes futures and prop bets for the 2018 college football season. Some sportsbooks chose to remove all Ohio State football odds entirely until the university completes their investigation. On Wednesday, August 1, 2018, college football reporter Brett McMurphy reported Ohio State head football coach Urban Meyer had knowledge of two 2015 domestic abuse allegations against Zach Smith, a former assistant under Meyer. Zach Smith was fired last week after reports surfaced regarding claims of domestic abuse by his ex-wife, Courtney Smith. According to Courtney Smith, several people close to Meyer knew about the 2015 allegation of domestic violence against Zach Smith, but Meyer did nothing and his former assistant was allowed to keep his job until news broke last week. McMurphy broke the story wide open when he reported he had obtained text messages, got an exclusive interview with Courtney Smith, and receive other information that Meyer knew in 2015 about the domestic abuse allegations against his former assistant despite denying knowing anything about the incidents last week at a Big Ten press event. Sportsbooks immediately took note of the story because not having Meyer, one of the best college football coaches of all time and winner of three national championships, would be a huge blow to the Ohio State Buckeyes chances of winning it all in 2018. At BetDSI, the Buckeyes were at 6/1 odds to win the College Football Playoff National Championship, but it is now off the board. The Buckeyes also had +120 odds to win the Big Ten and had a season win total at over/under at 10.5. BetDSI also had the Buckeyes as a 37.5-point favorite over the Oregon State Beavers in the first week of the college football regular season. However, BetDSI has added new Buckeyes head coach prop bets to bet on while Ohio State investigates the claims levied against Meyer. Many sportsbooks pulled the Buckeyes off future options for the national championship and Big Ten Championship until Ohio State has completed their investigation and decides on Meyer’s future with the football team. Other sportsbooks immediately adjusted the future odds, especially with Big Ten futures since the Michigan Wolverines, Penn State Nittany Lions, Wisconsin Badgers, and the Michigan State Spartans now all have better odds of winning the conference if the Buckeyes play the season out without Meyer on the sidelines.